Wed., Nov. 7, 2018, 3:08 p.m.
More candidates with degrees in science, medicine and engineering ran for Congress in 2018 than ever before. Of the nearly two dozen new candidates in this crop, six won or are projected to win seats in the House of Representatives. The newcomers, mostly Democrats, include Chrissy Houlahan, who has a degree in industrial engineering, who won in Pennsylvania. 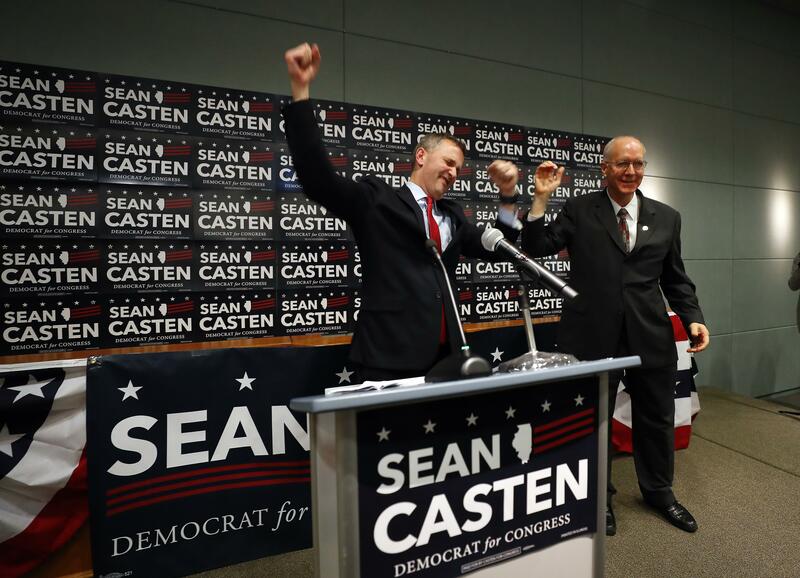 Sean Casten, who has worked as a biochemist, flipped a longtime Republican district in Chicago. Ocean engineer Joe Cunningham, who came out strongly against offshore drilling, won in South Carolina. Lauren Underwood, a registered nurse, is projected to win Illinois’ 14th district. In Virginia, Elaine Luria, who has a nuclear engineering background, defeated the Republican incumbent, Scott Taylor. Jeff Van Drew, of New Jersey, is a dentist. Pediatrician Kim Schrier is ahead in her race for Wisconsin’s 8th district, with more than half of the vote counted as of Wednesday morning. Two candidates with PhDs in science, chemist Randy Wadkins and data scientist Mel Hall, did not win their elections. Two incumbents with PhDs are projected to win: Rep. Bill Foster, D-Ill., a former high-energy physicist at Fermilab, and Rep. Jerry McNerney, D-Calif., who worked as an engineer and has a PhD in mathematics. The Democratic takeover of the House will likely shake up how Congress handles science. Rep. Eddie Bernice Johnson, D-Texas, is poised to take control of the House Committee on Science, Space and Technology. Johnson was the first registered nurse elected to Congress, and will be the first chair of the committee with a STEM background since the 1990s, when it was led by former engineer George Brown, D-Calif. She has a strong positive rating from the League of Conservation Voters, an environmental advocacy group. Johnson’s leadership of the committee will be a departure from that of its current chair, Rep. Lamar Smith, R-Texas, who will retire at the end of this term. Smith frequently questioned National Science Foundation grants, fought to curb federal research on climate change and used subpoena power to demand scientists’ data and correspondence. Johnson wasted no time setting a new agenda. In a statement released Tuesday night, she alluded to recent efforts by federal officials to change how science is considered in policymaking, declaring that “defending the scientific enterprise from political and ideological attacks” and “challenging misguided or harmful Administration actions” would be among her top priorities. In the same statement, Johnson affirmed that “climate change is real” and said she would seek ways to mitigate it. Congress will likely lose one of its most outspoken climate change deniers, Rep. Dana Rohrabacher, R-Calif., also a member of the science committee. (Rohrbacher told Pacific Standard last week that climate science was “bogus,” despite the overwhelming scientific evidence that climate change is real.) Democrat Harley Rouda is ahead in the race. The ripple effects of last night’s election won’t stop at the stratosphere, with possible impacts as far away as Jupiter’s largest moon. Rep. John Abney Culberson, R-Tex., a member of the House Appropriations Committee who oversees funding for the NSF and NASA, lost his reelection bid to Democrat Lizzie Fletcher. Culberson had been a leading advocate for exploration of Europa, an ice-covered moon that is considered a target in the search for life; this year he earmarked $195 million for a proposed lander mission. It’s not clear what will happen to the project now that its leading champion in Congress has been unseated. In a statement Wednesday, 314 president Shaughnessy Naughton congratulated several of the winners, including Jacky Rosen, a former computer programmer and Nevada representative who was elected to the Senate. “Rosen has already proven to be a staunch defender of science in Congress, and she’ll make an even better Senator who is committed to quality health care for all Nevadans, fighting climate change, and protecting Nevada’s environment,” Naughton said. Published: Nov. 7, 2018, 3:08 p.m.